The free version of Google Apps is history. The current sign up page makes no mention of the previously free Standard edition. 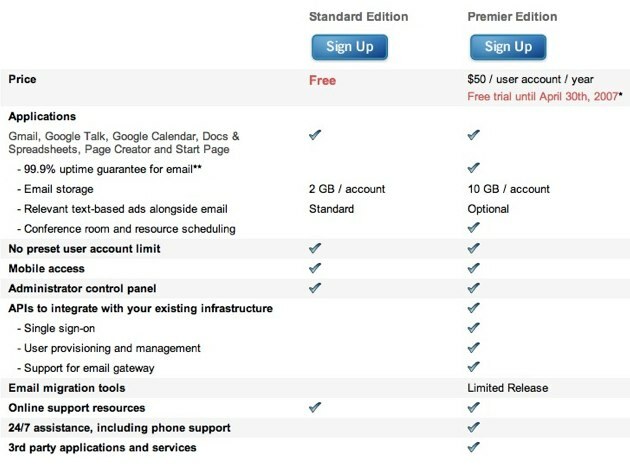 Instead, new users get a 14 day free trial, and then must pay $50 per user per year after that trial. Google Apps is a suite of online applications like gmail, Google calendar, Google Docs, etc. that are packaged and tailored for business use. Earlier this year we reported that the usage caps were being squeezed by Google over time for Google Apps, from 200 users down to just 50. When the service first launched in August 2006 it was free and described as “a service available at no cost to organizations of all shapes and sizes.” A paid version first appeared in 2007. I guess not. They didn’t move the cap down, they just killed the Standard product entirely. No mention of this change was made at a Google Apps press event held last month. You can actually still see the free version at this page. But it doesn’t appear to be linked to from any Google page at this point. We’re emailing Google for comment. Update 2: A link to the Standard edition has been added back to the landing page.